Bacteria that are susceptible to antibiotics can survive when enough resistant cells around them are expressing an antibiotic-deactivating factor. This new take on how the microbial context can compromise antibiotic therapy was published by a team of microbiologists from the University of Groningen microbiologists. One thing that should be noted is that the susceptible cells in the experiment stop growing, but don't die. 'Many antibiotic-induced killing mechanisms rely on dividing cells, or at least on cells with an active metabolism.' What doesn't kill the cells will perhaps not make them stronger, but certainly gives them time to pick up resistance genes from their environment. 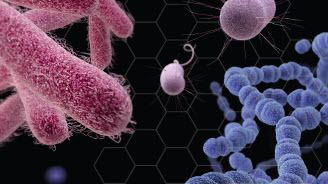 To prevent the occurrence of resistance in non-pathogenic microorganisms, it is of course important to use antibiotics as sparingly as possible. And perhaps one day, when our understanding of the mechanisms responsible for the spread of antibiotic resistance is more complete, we may find a way to stop it.